Ahh student discounts. They're on of the best things about being a struggling college student, even though they don't totally make up for the struggling part. With the new semester starting soon (if yours hasn't already), we're all about to leave the comfort of home cooked meals and our parents buying groceries for us very soon. I don't know about you, but I love sales and getting free stuff. Like a lot. Thanks to the lovely website that is Pinterest, I was introduced to the wonderful world of savings that your student ID can unlock. There are so many student pricing options that I had no idea were available to me. 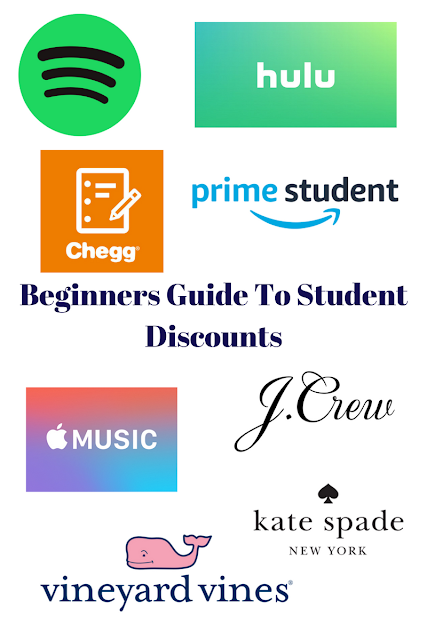 Today I'm going to share the discounts that I believe are most worth your time (because who wants to waste their time?). Let's go over the basics. A student discount is available with your student ID card, or your school email when you're doing things online. When you're in a store you can ask if they offer student discounts. A lot of places, like Kate Spade, do but won't let you use it if you're already getting another discount. It's always worth it to ask! A lot of chain restaurants will offer a free item or a discount with a student ID. Buffalo Wild Wings gives you 10% off and Chipotle will give you a free drink. A lot of companies like Adobe and Apple will offer special student pricing for their software. Amazon - 6 months of Prime services for free. 50% off membership after the trial period is over. (It’s super easy for transfer student to cheat the system. Shh no one tell). Spotify+Hulu - this is one of my favorite deals. Students can get Spotify premium for half off ($4.99/ month). Recently they’ve teamed up with Hulu and students with a Premium Student account can activate Hulu for no extra charge. Just make sure you use the same email for both to make things easier. Apple Music - similar to Spotify you can get Apple Music student pricing at $4.99/month. Chegg - If you haven’t discovered Chegg yet you’re really missing out. You can rent or buy hard copy or online textbooks. They offer free shipping on orders over $50. My books were so cheap last semester I didn’t even reach the minimum (a bit of a win-lose but oh well). They also pack the box with tons of cool stuff. You get free samples and exclusive offers for a variety of services. Definitely worth a try. Kate Spade, Vineyard Vines and J. Crew - 15% off your purchase . What are some of your favorite discounts I missed?